It’s a new year. Many of us have vision of a “new you” as well. With God, call it possible. After all, Jesus came to earth, bringing heavenly possibilities with Him. This post may contain affiliate links. If you click on them, I may receive compensation to help pay for the upkeep of this website. The good news? It’s at no additional cost to you. Disclosure. Thanks, friends! The Lord spoke His promise. Joshua ran with that promise, leading the Israelites accordingly. After gathering the promise and instruction, they implimented the process. Because marching for 7 days, once around the city 1 time each for 6 days and 7 times the final day, IS a process. It’s not an instantaneous, click-your-fingers God move. Amid the process, however, the promise remained. It simmered all along. And even though that promise came to fruition after a period of time and through a process (work by those trusting God), it came because God was faithful to fulfill His promise. The part I love most is summed up simply in Joshua 6:27. The LORD enabled Joshua to commence and complete the tasks. He offered the promise; He brought victory. The stellar leadership? It happened because of the LORD. The promise rose because of the LORD. The walls crumbled because of the LORD. The “new” Joshua and Israel experienced? It came straight from Above. Truly, it’s all about the Lord. And your life is about Him, too. It’s a new year. You might be looking for a “new you”, a resolution of the common type. Or, maybe last year proved horrendous and you want something more. Why not look for transformation from the One whose muscle makes possiblity happen? Make 2019 all about God. Grab His promises and stand solid, friend. I’m convinced there’s one place to start a new year’s transformation that will transition into a whole life version: in His presence. Feelings of inadequacy is the #1 battle my readers face. I’ve face the ugly wrestle, too. But with God we overcome and find a solid stance in freedom. I am a walking testimony of this and desire you to be one, too. This free, new resource, is located in the Subscriber Library. It’s a sheet of truth, affirmations, and prayers based on the Word of God. Each one listed will help you identify yourself with the solid stance of Jesus Christ–not fleeting feelings, wobbly circumstances, or the inaccurate labels others paste on us. So go ahead, grab your free copy. If you’re already a beautiful subscriber, click here. Not a subscriber? No problem. Simply sign up here. 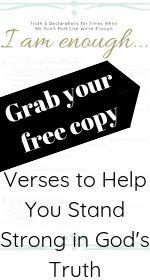 You’ll receive access to this library download as well as many other faith-building printables. (Watch the spam folder, however, as emails land there from time to time.) You’ll also receive weekly updates and “3”, the family connection newsletter. It’s a place where we get a little more personal and share tips like this recent iphone shortcut. Why not simply sit in the quiet with Him? Converse. Listen. Here’s a prayer I offer regularly, words that somehow usher a heart straight into His presence. God answers every.single.time. Why not begin here for true transformation in 2019? God alone knows the struggles and lies hiding in our heart. Why not go to the One who offers true transformation? Once I pray that prayer and wait His answer (which comes in a matter of days sometimes, months other times), then the process begins. God unveils that which defies. It’s like finding Jericho on a map. Then, He gives direction on how to march and watch the walls fall. In that place, victory waves its flag. There’s a second place that settles us among the utterances of God Almighty, opportunity He offers in the pages of His Word. One way to dig into these love letters from the Almighty is a Bible Reading Plan like the free ones offered here. A third way? Memorizing scripture. It sets truth solidly within, allowing us to recall truth when evil dangles questions. So there you have it, friend. Grab a hold of Joshua while heading into this year. Let’s stay in the presence of the Almighty–you encouraging me and me you–as we work through those promises and processes. Let’s open our Bible, too, allowing His truth to imprint our heart. Most importantly, praise the Lord. How about 10 free gifts to help deepen your faith? 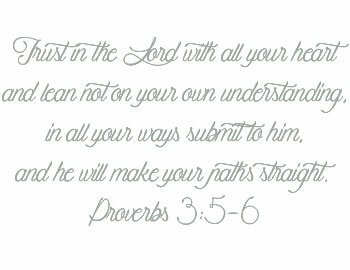 I remember the days when I downloaded free scripture printables from Ann Voskamp‘s site. Back then, the most beautiful music from David Neuve played in the background. Now, I write to his melodies often. Earlier this week, I came across some of those slips of paper with scripture–all printed from Ann’s site years ago. (Don’t ask why I keep things that long…because I really don’t have an answer!) I printed the freebies way back when to encourage our kids, before any of her books hit bookstore shelves. I followed Ree Drummond on the blogosphere years before her products landed on store shelves and even further back before she hit television airwaves. It was so far back in time, there might have been a dinosaur or two pounding the pavement. 🙂 Just for the record, she offered amazing recipes back then too. And I downloaded them–for free. Once again, the holiday season swirls among us, a new year on its tails. Just as Ann and Ree offered free items years ago for readers’ pleasure, encouragement, and growth, a few free items await you and me on the Internet today. We’re going deep in God’s Word in 2019 to secure truth for these (and more) uncertainties deception spins. Because often what and how we feel about ourselves teeters on the enemy’s lies. But God sets our identity secure on His truth. Onward to our list of 10…. Don’t Forget to Check Out These, too! Gift Ideas for Your Faith-Filled Christmas. And that’s it for this list of FREE items…just for you. What is the Utility of Biblical Archaeology? Please allow me to introduce you to a dear friend from Tony’s and my Virginia Beach days, Don McNeeley. If you remember from July’s “3” Newsletter–where we connect on three interesting, personal, and/or helpful topics each month–my family and I visited with friends back east this summer. That visit included a Biblical archaeologist and his beautiful wife. That archaeologist was Don. The story of David, lamp sizes of the time, and Psalm 119 danced to life in a whole new way with Don’s words and archeological finds. Today, we have the privilege of digging into Biblical archaeology to help illuminate Scripture right here on KristiWoods.net. So take a seat, prop up your feet, let Don do the shoveling, and soak up the insight and potential found with these archaeological digs. Biblical archaeology has the unique capability of connecting the biblical text with cultural remains from the times of the scripture. These cultural remains assist in illuminating the scripture and can at times even provide interpretative understandings that would be missed by the casual reader. As a biblical archaeologist, I am constantly looking into the sands of time to obtain information that will help me understand scripture. For this article, I want to describe two archaeological artifacts that have expanded my understanding of interesting sections of scripture. The picture here is an Iron I age bowl from Israel. It is a finely made bowl and lacks evidence of much service. In many ways, it could be considered to reflect a piece of “china” from the Iron I period. The Iron I age is associated with much of the book of Judges and it is in Judges 5:24-26 that I can see an example of how archaeology assists in understanding scripture. The situation in Judges 5:24-26 is that King Sisera is fleeing for his life from the army of the Israelites. He comes upon a desert tent and seeks shelter. It seems that Sisera is comfortable with resting in this tent, maybe because he thought he would be protected. The question that seems to beg itself is why did Sisera feel safe enough that he would easily go to sleep, knowing that the Israelites were on his trail? The mention that the bowl is a noble’s bowl and what that bowl may have looked like are clues to the answer. The daintiness of the bowl reminds me of dinners when the china comes out of the cabinet where it has resided since the last special meal. It is extremely thin and has a graceful curve to it. Just like your use of “china” for those special meals, the scripture states that this bowl was a “noble’s bowl” used to serve special people. Judges 5:24-26 implies that Sisera was received as a special guest. Just like during special meals today where the food is served on “china”, the milk for Sisera was served in the “china” of the day. The use of the “china” symbolically conveyed to Sisera that he was being honored and therefore he felt safe and secure. With that knowledge, he fell asleep thinking he had nothing to fear, but alas the story concludes with Jael killing Sisera with a tent peg into his head. So, why Sisera let down his guard is explained by his being served milk in a noble’s bowl. The Hebrew word used in this scripture to indicate the word flask is for a small jug. So, while we may think of a flask being used, in reality it was a small jar. Again 1 Samuel 10:1 is situated in the Iron I period and the picture here is of a small jug from that period and represents the one Samuel used. This small jug is about six inches tall and three wide at its largest diameter. It is a really small jug and would not have held much oil. Additionally, the small jug is made out of clay, so if dropped it would have easily shattered. Using this information from the scripture combined with the archaeological data, it is possible through the use of a small fragile jar of oil, Samuel is foretelling the length and frailty of Saul’s reign. Biblically, oil frequently refers to the Holy Spirit. Such a small jar would not have held much oil. Samuel might have been using the small jar to indicate how long the Holy Spirit was going to cover Saul as he reigned. Additionally, the frailty of the jar might have been used to indicate the fragile nature of Saul’s regime over Israel. While some of this understanding comes about through a knowledge of Hebrew, the archaeological evidence of a small jug brings life to the verse and its political prophecy. I hope these two examples of understanding the archaeological artifacts illuminate the biblical record. If you desire to receive a newsletter in which I discuss biblical archaeology, please send your email address to don@cbrgroup.org. I will place you on my newsletter. Don McNeeley has excavated at two biblical sites in Israel (Shiloh and Maqatir) over the past eight years and traveled throughout Israel many times. His passion is to understand the archaeological data and how that data illuminates our understanding of scripture, spiritual formation, and even worship. Don uses the knowledge gained from the trips to Israel in his teaching biblical studies at Tidewater Bible College in Virginia Beach, VA.
Jug and bowl photos by Don McNeeley. Used with permission. Linking with other Jesus lovers here: #heartencouragementThursday, #faithonfire.